It’s been a few weeks since the Intro to Hand Work class finished and I miss it. I really enjoyed the freedom of sewing without a sewing machine. It meant that the class group was able to sit around the large table, chatting and working away at the same time. It also meant I was able work on my project when I was on transit or sitting in bed late at night. We basted our final sawtooth star blocks with a layer of batting and a muslin backing, just like a mini quilt. 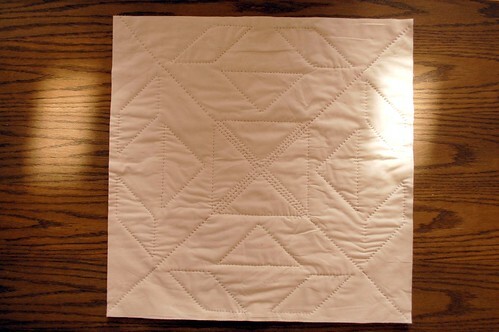 I kept my quilting design very simple, echoing the shape of the patchwork lines. It’s cool to see the hand quilting pattern from the reverse side. 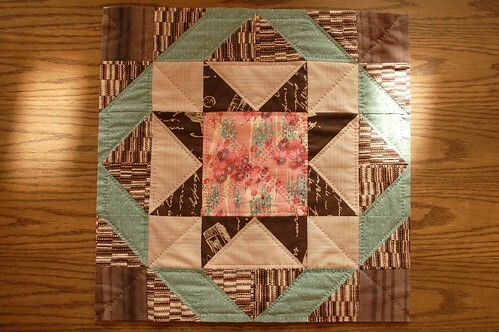 I used both a round quilting hoop and a square Q-Snap frame when doing this project. I like having the flexibility to switch between the circular and square frame as I choose. Hand quilting is amazing. I just love the way the it looks. When I see it, I unrealistically want every quilt I make to be hand quilted. The slightly uneven quality of the stitches is so charming. Turning this one block into a pillow was so incredibly satisfying because the entire project was completed within just one month. It seems a big feat, compared to the ongoing quilt projects I have that are a year or more in the making. 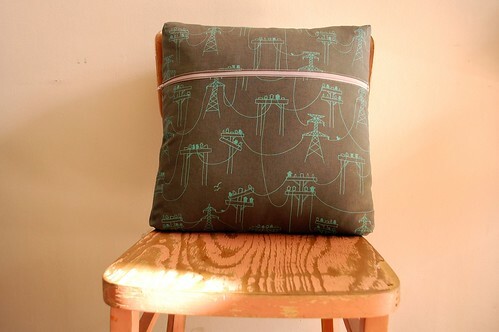 I chose to use the turquoise powerlines on grey print from Repeat for the back of the pillow. It couldn’t be more perfect. I love everything about this graphic pillow. I’m so proud of it! 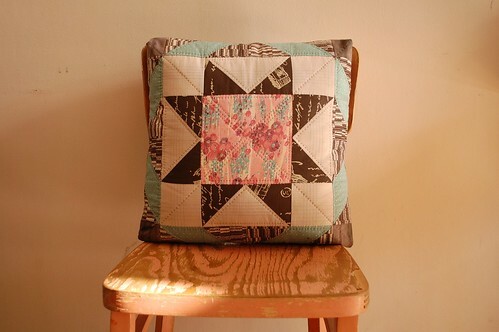 I’m pondering my next hand piecing/quilting project and think it’s about time I did an English Paper Pieced pillow. I created this gallery with some of my inspirations. love it! 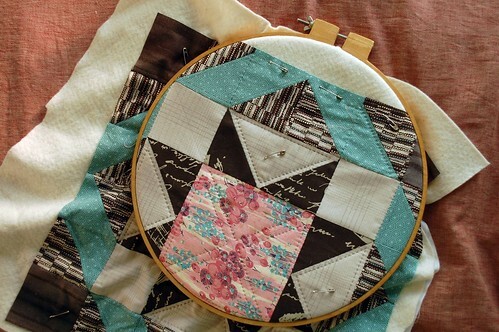 I love the color combo, and your hand quilting looks great. I want to start hand quilting, but maybe a baby quilt first! Karyn, your pillow is lovely. The colors are fantastic, and the quilting is really nice–I think that outlining the piecing was a great choice, since it emphasizes the graphic nature of the fabric and the star/border. I went over to Carolanne’s last night, and she had finished the pillow she was working on as she taught the class, as well as another one in a different pieced pattern–both are gorgeous. You two make me want to make more pillows! Amish quilts are all handmade. If you go here (http://www.amishcountrylanes.com/Pages/index.shtml) and take the quilt tour, for each quilt they have 8 pictures that show more detail including the incredibly tiny hand stitches. These quilts are just amazing! All completely handmade. I love hand-quilting, too 🙂 It’s so tactile and satisfying and the freedom to do it wherever you want is really refreshing. I wish I had more hand-work projects! So beautiful! 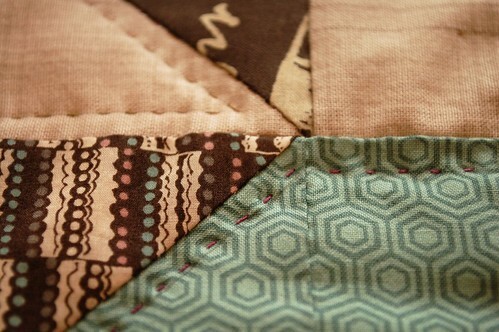 I love all the details of the hand quilting and the combination of colors you’ve used! I absolutely adore your pillow, especially the contrast between the fabric and the quilting thread with makes the quilting pattern stand out so well. I might be a little biased, but I think that pillow is just lovely. I think you’ve been really clever with the fabrics you’ve used. Making something which is very traditional look modern. I’d have one in my home. Hi, I just found your blog from Flikr and this is as far as I have gotten so far! Love the pillow! It look gorgeous! I have hand pieced and hand quilted a small quilt and I am like you, I love it! Its great to be able to sit on the couch with the family and still sew. It looks like you have your fabric tight in your hoop, I use a hoop but my quilt is always really loose in it.So just for my curiosity because I am new to this too, Do you use the Rocking Method or stab stitching or a running stitch? Whichever you use, it looks so great! Sorry for such a long comment! I better go see the rest of your great blog! kelli – nice to meet you! i should probably play around with how tight my fabric is in my hoop a bit more to see if i can get better results. i use the rocking method, which i feel i have kinda gotten the hang of and i really like it. i found it really tricky to master, but once it ‘clicked’, i feel like i just keep improving. what method do you use?